The economy is in a tailspin. No one knows where bottom is. It’s a grim time. For $24.07 lunch and $35 dinner, you can get all dolled up (in the clothes you already own – we are, after all in a recession), and go out on the town to enjoy a three-course meal from a special prix fix menu. With the food bill so modest, there’s even money left over for a couple glasses of wine—although you may have to search hard on these lists for a modestly-priced bottle. Indulge in old-money places like Delmonico’s, which bills itself as America’s first fine dining restaurant (opened in 1837). Delmonico’s is a grande dame of American cuisine: in its famous kitchens the first Delmonico Steak, Eggs Benedict, Lobster Newburg, and Baked Alaska were created. Or swing by that former speakeasy and forever NYC icon, the 21 Club. Duck under the lawn jockeys that top the doorway, and guys—dig that jacket out of the back of your closet. Feeling like something a little fresher? 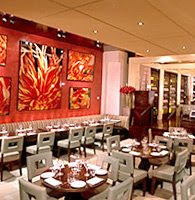 How about either of French chef Daniel Boulud’s more casual Manhattan eateries: Bar Boulud or db Modern Bistro? (Sorry, his elegant Café Boulud is not on the list). There are dozens more to choose from, including romantic spots like One if By Land, Two if by Sea and Water’s Edge, which offers a spectacular view of the Manhattan skyline from Long Island City (a ferry service is available from Manhattan—which kicks off the romance and view before you even get to dinner). The full list of New York Restaurant Week participating restaurants is posted here. So book your table and forget the economy for a night of indulgence. Montclair, NJ is also having a restaurant week, Di. How about suggesting some places closer to home? Are You a Big Lover of Bordeaux?